Have you heard of The Switch Witch or The Candy Fairy? She’s a candy collector that, much like the Tooth Fairy, comes to visit overnight and switches out all the extra Halloween candy with special toys or other treats. This is great for children that have food allergies and can’t eat a lot of the candy they receive or simply to donate some of that over-sized loot of candy your child collected on Halloween. I remember going trick-or-treating as a kid and I’d head out with a pillowcase to collect my candy. I’d often have to run home to dump my stash before running outside for another round. I have no idea what I did with all of that candy – I’m pretty sure my dad was helping to eat it when I wasn’t looking. 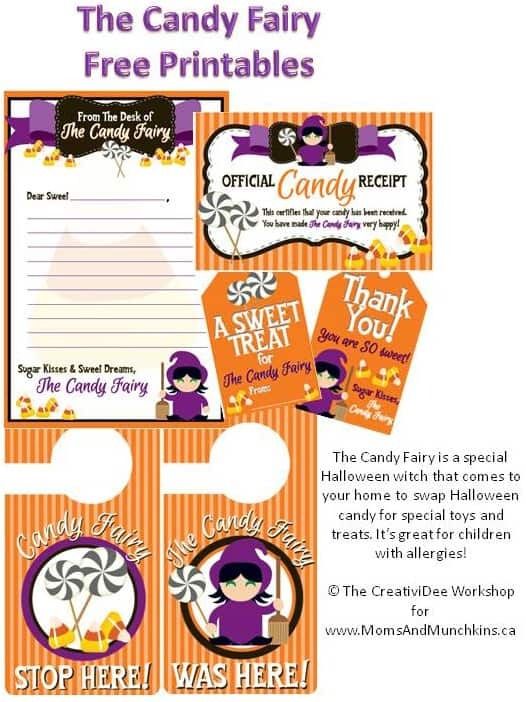 Our free printable this month is a set of Candy Fairy printables that includes an “official” letterhead from the desk of The Candy Fairy, an official receipt to be left after the collection, a tag for your children to attach to the candy they want to donate, a tag for The Candy Fairy to attach to their gift, and two door hangers – one to invite The Candy Fairy in and another to indicate that she has completed her visit. Did you know that The Switch Witch has her own book with doll? It’s such a fun tradition! These Candy Fairy printables are exclusive to Moms & Munchkins newsletter subscribers. Signing up is free & easy! Simply enter your email address, confirm your subscription, and you’ll be directed to a page with a link to the freebies page along with the secret password. This link and password will also be repeated in each of the monthly newsletters. A big THANK YOU goes out to the fabulous Denise of The CreativiDee Workshop for creating these printables for us. She’s so talented and always understands my visions for the monthly printables. She always amazes me with her creativity! Visit her site for free printable organizers and loads of printables for family fun.